To speed Sluggy up, we used high-tech, friction free, performance-enhanced runners. 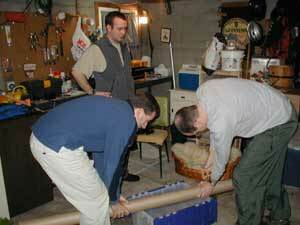 Okay... they were simply cardboard tubes. 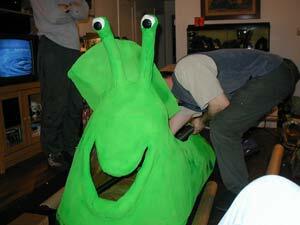 Sluggy exposing his innards. An slug enema? No, we were just securing the runners from the inside. We had to cut a hatch so Dustin and Katie could actually get into the sled. It was a very tight fit, but Katie and Dustin were able to get in the sled (If it were any tighter in there, we would have been forced to buy a pregnancy test). The picture on the right shows what it looked like when we traveled with Sluggy. We had to go slow, but people didn't seem to mind. 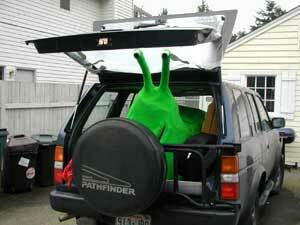 In fact, cars were lining up behind us to view fluorescent green creature.